My faith in human nature, in the capacity to change, grows with every year. My faith in the essential goodness of life increases. Yet my faith in politics has withered. (T)here’s a vulgar aspect to the craft. Even when you’re dealing with the most private, intensely personal moment of pain, if you do it well enough, if you handle it correctly, you immediately pat yourself on the back . . . I might as well be honest about it. An extraordinary sculptress, Helen Martins, lived in the little village in the Karroo where my house is. For twenty-two years of her life, starting at the age of fifty, she handed herself over to an incredible creative energy. She sculpted away, single-mindedly, with a total obsession. Then, mysteriously, her creativity dried up and she committed suicide. From time to time I’d say to myself, Come on, deal with it. You’re a writer; this is extraordinary. But I kept pushing her aside. Then her story became such an urgent reality inside me, I needed to examine it. The Road to Mecca focuses on the possibility that creative energy can exhaust itself, probably the most frightening reality an artist can face. Every artist lives in total fear of that—I know I do. I kept wondering whether, with an act of terrible prescience, in describing the end of Helen Martins’s creative energy, I was in fact writing my own epitaph. 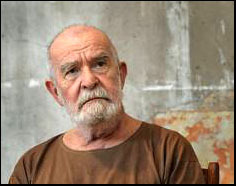 Part IV of the Athol Fugard series will post next Wednesday. This entry was posted on Wednesday, November 14th, 2012 at 7:07 am and is filed under acting, actors, death, drama, playwriting, quotes, relationships, theater, writing. You can follow any responses to this entry through the RSS 2.0 feed. You can leave a response, or trackback from your own site.